Who doesn’t use cast-iron cookware whenever he/ she find the right time to use it? Well, almost everybody does! Due to its even heat dispersion property, everybody prefers cast iron pans whenever possible. Cast iron utensils are built with a quality to yield exceptionally delicious food at high and low heats both. Why is Cast Iron Cookware avoided? Cast iron cookware is best for all kinds of stoves; electric or gas and on induction cooktops and even on the fire lit during your camping hours. The only thing because of which cast iron is a bit avoided is its seasoning process. Yes, the seasoning process! How to season cast iron utensils? There are a number of theories and methods based on seasoning the cast iron cookware. The writings were comprised of complex cycles of heating and oiling the utensil with vegetable and animal fats. When is it the time to season your cookware? The seasoning is required when the cast iron pan makes the cooking process a bit difficult and creates a semi-nonstick surface. To remove such hurdles, a variety of seasoning methods used by all cast iron pan consumers. What did Sheryl Canter write about cast iron pans? After the emergence of so many methods and researchers, Sheryl, a blogger, claimed to find out the best way to season cast iron pan in 2010. According to her, the method would prevent the cast iron from rusting and will not require frequent seasoning. Without wasting anyone’s time, Canter revealed the method and so are we going to. Flaxseed oil is the one to bring the smoothness of your cast iron pan. After all, no kitchen is complete without cast iron cookware, so, one day or the other; the mystery had to be solved. How Flaxseed Oil proved itself? After so many practical testing, flaxseed oil has proved best and durable. Flaxseed oil is equivalent to linseed oil which is often used by the artists and painters. They used this oil to give their paintings hard and polished finishing. What does Flaxseed Oil have in it? Flaxseed oil boasts six times the amount of omega 3 fatty acids than vegetable oil. Prolong exposure to heat forces the fatty acids to combine and form a solid matrix to polymerize the pan’s surface. This is the reason, flaxseed oil is considered to be the best for seasoning. How did it become popular? Canter’s blog was so strong and impressive that it got viral in no time. 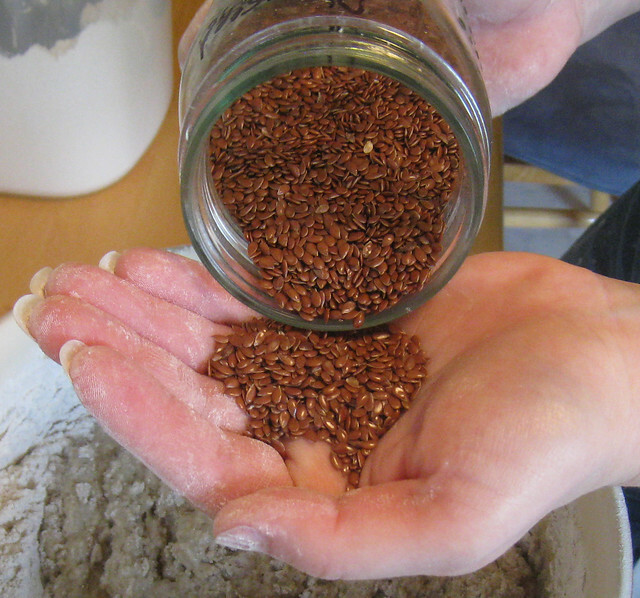 People began to use Flaxseed oil and ended up with wonders. Well, to have a personal experience of it, we had to strip our cast iron skillet. Why and how we intentionally stripped our skillet? What can be worse than stripping one’s favorite skillet? But we had to take this step in order to get first- hand experience. The skillet wasn’t brand new, so, it was easy to strip it. In a few weeks, the surface of skillet seemed to be rough and uneven with sticky rusty spots on it. Obviously, scrubbing it with ordinary oil won’t help anymore in such condition. This was when the right time to experiment re- seasoning was found. It seemed to be a bit scary and nervous process for the first time. What could be done to readily set the skillet for seasoning was, to scrub it vigorously with soap and hot water. After that, set it on medium flame to dry it out. After this stripping process, the skillet is perfectly ready for seasoning. What are the requirements for selecting the right flax oil? After giving a proper read to Canter’s article, you will find out that her requirements were very particular regarding flaxseed oil. Certainly, those requirements were for a good reason. The wrong selection of flax oil won’t help you in the re-seasoning. For your convenience, we have mentioned the properties of the right flaxseed oil for re- seasoning of cast iron below. The oil should be pure and made up of 100% flaxseed with no additives, oils or flavors to prevent oxidation. If the label has the words “lignans” or “flaxseed particulate”, then it also considered as the pure flax oil. The right kind of flax oil requires refrigeration because of its omega- 3 supplement. The oil goes rancid with this supplement. So, if your bottle says that it doesn’t require refrigeration, then you have cleverly brought the wrong bottle home. Canter has advised going for organic one. She writes “you don’t want to burn toxic chemicals into your cookware to leach out forever more”, so, organic flax oil is the right thing. Canter didn’t mention anywhere in her blog about the filtered or unfiltered oil. Both the choices are good but we would suggest the one which she went for. The bottle she picked up says that it contains the unfiltered flax oil. After the detailed discussion of the usage and selection of right kind of flaxseed oil, you would surely like to know the seasoning process. Let’s first quickly see the important things about the process and then move on to the steps. The re-seasoning process will last for three days for a stripped cast iron pan. The total oven time is about 18 hours, which means 6 hours for actual baking and the rest 12 hours for cooling. The cooling time can be plus minus 12 hours, so, don’t get worried. There is a total of six oil coats on the pan during this process. The re-seasoning process is mentioned below in simple words for your ease. You may have a quick overview of the procedure if you want to re-season your cast iron cookware. Pour the flaxseed oil into the pan directly from the bottle or by a spoon. If you are hesitating while pouring the oil directly from the bottle, then starting off with a spoon is a good thing. You may add as much oil as required by the pan. The next step is to rub the oil all around the pan. Using a sponge may result in the absorption of oil, so, your hands can do this job well. You have to cover every part and corner of the pan. Every part includes the inside and the small raised wall, the bottom and the handle of the pan. Now you need a paper towel to wipe off the oil. An extremely thin layer of oil is required on the pan, so, a paper towel will serve the best. It will help you remove oil the oil and will show no visible contents on the pan. After removing the oil, place your cast iron pan on the middle oven rack inside your cold oven. The pan should be in an upside down position. After putting it in a cold oven, turn the oven on and set it to its highest possible temperature. Let the pan preheat along with the oven for some time. Set the timer for one hour when the oven is properly preheated. Keep your kitchen and the surroundings of your oven ventilated. The windows should be opened with a full speed ON fan and a working chimney. The baking/ burning will make your kitchen smoky and a bit smelly due to the flax oil used. So, don’t let the smoke stay in your kitchen. Turn the oven off after an hour and wait for it to cool down but don’t open the oven door instantly. Wait for a couple of hours to let the pan cool inside the oven. Once the pan is cooled down, you can repeat the procedure. Make sure that the pan is cool enough to touch by naked hands. If not, then you have to wait for some more time to repeat the process. Repeat the same process for 5 more times, which means a total of 6 cycles are required for the re- seasoning of your cast iron pan. After the completion of the whole procedure for the six times, you will observe that you have manages to regain the matte black finish. No magic is done on the pan, so, it will only look better and smooth. Each successive seasoning will make the skillet’s finish better and sleeker. After the end of last seasoning cycle, you will feel like that the pan is just bought from the market. It won’t give you a feel of an old rusted pan. No stickiness, no uneven surface, no clots, and spots, just like a brand new pan. The sheer silver coating will also impress you once you will try it on your own. You can buy the pure flax oil used by Canter via Amazon by clicking the link below.